You would expect to find NASA-created technology on the surface of Mars, but what about in water bottles and baseball stadiums? The products that the space agency develops have filtered into everyday life for decades, and for decades the NASA publication "Spinoff" has chronicled their progress. The latest issue is now available for free online, and what's inside may surprise you. For instance, technology created by Johnson Space Center's Advanced Refrigeration Technology Team is now being used to save lives in parts of the world that have little access to electricity. The engineer who used to lead the team founded SunDanzer Refrigeration Inc., a company whose solar-powered refrigerators have been used in rural areas to preserve vaccines. SunDanzer's biggest customer is the United Nations Children's Fund, which buys 40 percent of all the units sold worldwide, NASA officials said. NASA technology has also made its way into baseball. 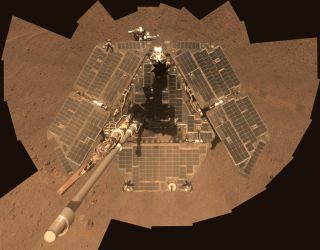 The panoramic cameras on the agency's Mars rovers have been translated into devices that capture gorgeous panoramic photographs at Major League Baseball stadiums. High-resolution cameras take 360-degree photos of a stadium during the game, and afterward fans can go online, find themselves in the shot and tag themselves on social media. And the next time you bring a water bottle on a bike ride or a hike, consider that you may be holding material first developed in conjunction with Johnson Space Center, which is in Houston. A new, two-level filtration system originally developed to recycle water on the International Space Station has made its way into commercial application, helping world travelers avoid ingesting nasty bugs such as E. coli and Cryptosporidium. NASA also publishes "Spinoff Tomorrow," which describes current technology not yet licensed for commercial use. To learn more about NASA's space tech spinoffs, visit: http://spinoff.nasa.gov.